To attend a group, just turn up on the day or call us about availability. Stay and play sessions on term time Monday and Wednesday mornings for parents and carers of 0–5 year olds. Our large, sunny hall is full of toys, ride-ons, slides, trampolines, dressing up, colouring, books, art activities and our bouncy castle! 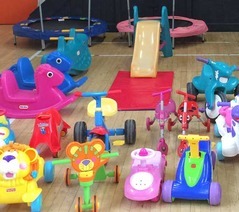 We have a dedicated area with mats and toys suitable for babies and very young children. It's a great way to relax with a drink and make friends whilst your child plays in a safe environment. We offer a discount for siblings or on a discretionary basis for families on income support. 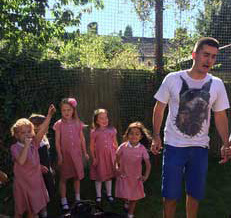 Children in Reception to Year 5 can get together to enjoy sports, art, cooking and games. Learn new skills, relax and make friends with other. Discounts available for siblings or families on income support. We can pick up from Lowther Primary. Term time only. The Community Kids Club has most recently been supported by Barnes Workhouse Funding. Sunshine Nursery is located behind the Centre and is well known for providing exciting and stimulating childcare.